I’m on a roll the past week it seems with fixing or upgrading my MacBook. So I’ve decided to wrap things up with upgrading my internal hard drive. I’ve noticed that my MacBook is kind of sluggish lately, especially when booting. I was also running out of storage space, so it seemed like a good opportunity to upgrade my internal hard drive. The MacBook Pro 17″ Core Duo I have originally came with a 120GB 5400rpm Seagate Momentus. I thought this drive was a great drive in my opinion so when upgrading, I decided to go with a newer, larger Seagate Momentus. 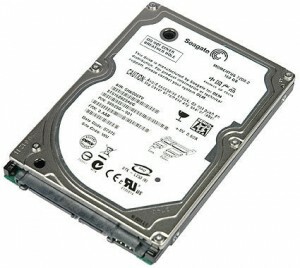 The model I chose was the 320GB, 7200rpm drive. Installation took about 20 to 30 minutes, mostly because of all of the screws you have to take out to open up the case. Upgrading to the 7200rpm drive was definitely a good choice. While having the fast drive will probably deplete my battery quicker, I thought having it was worth it to have faster boot times and faster disk access times. The 320GB should provide all of the space I need for quite some time. Oh, and I didn’t discard my old drive. I spent another $40 and bought a Firewire/USB 2.0 enclosure, so now I can bring my old drive with me on the road and use it to store bigger files and back up my data.